Caries, or tooth decay, is a preventable disease. 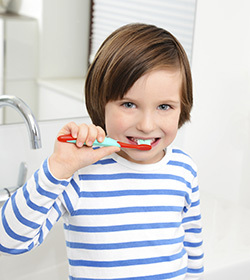 While caries might not endanger your child’s life, it may negatively impact their quality of life. When your child’s teeth and gums are consistently exposed to large amounts of starches and sugars, acids may form that begin to eat away at their tooth enamel. Carbohydrate-rich foods such as candy, cookies, soft drinks, and even fruit juices can leave harmful deposits on their teeth. Those deposits bond with the bacteria that normally survive in the mouth and form plaque. The combination of deposits and plaque form an environment that can damage the mineral structure of teeth, resulting in decay. Your child’s teeth expand and contract in reaction to changes in temperature. Hot and cold food and beverages can cause pain or irritation to children with sensitive teeth. Over time, tooth enamel can be worn down, gums can recede, and teeth can develop microscopic cracks, exposing the interior of the tooth and irritating nerve endings. Just breathing cold air can be painful for those with extremely sensitive teeth. Delayed exfoliation of primary teeth, or the delay in losing baby teeth, is a common dental problem in children. Baby teeth hold the space for permanent teeth and must fall out in order to make room for the permanent teeth to come in at the correct position. This process usually occurs between the ages of 6 and 13. In order for permanent teeth to erupt correctly, it may be necessary to have the affected baby teeth extracted. If your child experiences delayed exfoliation, early orthodontic treatment might be recommended as well. Dental emergencies involving trauma are also common among children, with 10% of children experiencing trauma to their primary teeth. 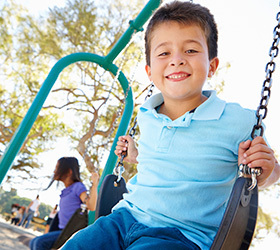 Dental trauma can be caused by falling at the toddler stage, playground and bicycle accidents in school-aged kids, and car accidents and athletic injuries in teens. Dental trauma occurs when a tooth is knocked out, loosened, or fractured. If this happens, it is important to call our office immediately, even if it is after hours. We may be able to see your child immediately or give advice until we can treat them the next morning. Gum disease (periodontal disease) can cause inflammation, tooth loss and bone damage. Gum disease begins with a sticky film of bacteria called plaque. Gums in the early stage of the disease (gingivitis) can bleed easily and become red and swollen. 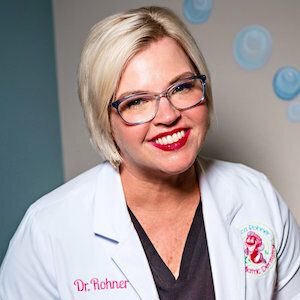 As the disease progresses into the later stage (periodontitis) teeth may fall out or need to be removed by Dr. Rohner. Gum disease is highly preventable and can usually be avoided by daily brushing and flossing. A good indicator of gum disease is consistent bad breath or a bad taste in the mouth. Canker sores (aphthous ulcers) are small sores inside the mouth that often recur. A canker sore typically has a white or gray base surrounded by a red border. Generally lasting one or two weeks, the duration of canker sores can be reduced by the use of antimicrobial mouthwashes or topical agents. A bite that does not meet properly (malocclusion) can be inherited or acquired. Causes of malocclusion include missing or extra teeth, crowded teeth, or misaligned jaws. Accidents or developmental issues, such as finger or thumb sucking over an extended period of time, may also cause malocclusions.